Ever wonder what Star Wars would have looked like if George Lucas had kept his first draft ideas? 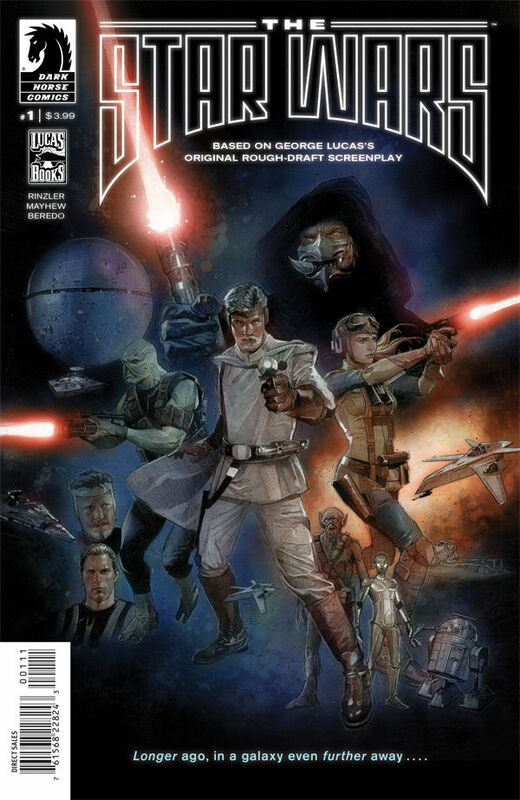 The Star Wars #1 is the first issue of an eight-issue maxi series ending in April. Read the plot section for more detail, but basically this is the world of Star Wars that George Lucas first presented, before the adaptions. Now, I know what you die hard Star Wars fans are thinking: everything George Lucas touches turns to poo. This cannot possibly be good, right? Well hold onto your butts, because this one might surprise you. So far, I’m really enjoying the art style more than anything else. The faces are drawn in this realistic, almost oil painting-style that captures the features of the cast of the movies…but in the original costume designs. So I’m in love with the look, what’s the story? Well, so far, I’m mostly confused, so I’ll have to wait until issue two to see if the story becomes a little easier to decipher. Having the strangely familiar-yet-new feeling of the re-using of names is throwing me off a bit as well, but not necessarily in a bad way. I kind of like new and different. Before Star Wars, there was ‘The’ Star Wars! This is the authorized (that means it’s official, kiddos) adaptation of George Lucas’s rough-draft screenplay of what would eventually become a motion picture that would change the world.